Our beautiful bar at El Zafiro is directly at the beachfront with the gentle, fresh, open-air sea breeze flowing through all day and all night. Guests can sit at the bar for wide varieties of expertly crafted cocktails or even for simple rounds of your favorite beers. Our bar services guests for drinks with meals at the bar, tables, and also out to the beach to the lounge chairs. Some of our signature cocktails include the coveted Mojito, Aperol Spritz, Mango Margarita, and many many more. 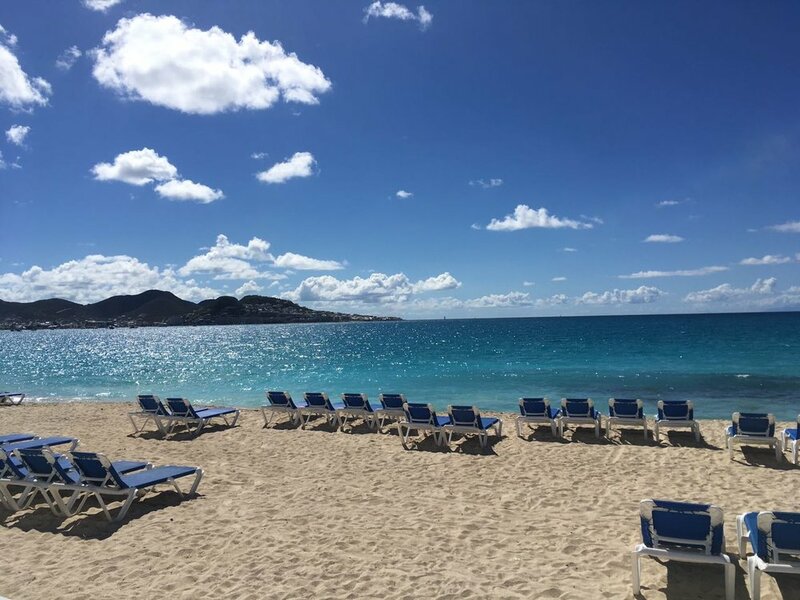 Our beach at El Zafiro is like no other place on Simpson Bay and perhaps unlike any other location on St. Maarten. We are tucked away in a secluded part of Beacon Hill which creates the opportunity to come and relax and enjoy the beach, sun, food, drinks, without a commercial feeling that one might experience regularly in other parts of the island. We are an oasis for those seeking gastronomic delight, comfort in the ocean breeze, refreshing cocktails and beverages delivered right to your beach lounge chair, yoga and other fitness options hosted daily, volleyball, and other water sports activities and equipment at your disposal. On our beach we can also host/create your events such as weddings, anniversaries, work functions, conferences, etc. Have you ever done Yoga and other fitness activities, or even meditation classes, on the beachfront with the fresh breeze keeping you feeling refreshed minute by minute? At El Zafiro, we regularly offer varieties of fitness classes such as yoga, pilates, kizomba, etc - right on the beach front! We are careful to ensure that the very best teachers on St. Martin are guiding these classes here. (Please check for our posted weekly schedules for morning or evening class options) After our classes people can join us for specials on food and drinks. Finishing a morning yoga with a fresh breakfast and juice or evening pilates topped off with an added lightness from one of our mindfully executed high antioxidant cocktails.